Unprecedented Technology: Deephunter metal detector is the first detector in the world to combine the ability to locate Deep Treasures, Cavities and Individual Coins in one unit. Now, you can purchase a single, powerful detector that is capable of locating BOTH individual coins AND larger treasures at extreme depth. Deephunter metal detector features both a non-motion mode and a motion mode. Experience the fast and deep detection that others have only dreamed of. Its like getting two detectors in one. Switch your detecting style at the touch of a single button. Choose from two modes: 1.A powerful deep seeking mode for locating treasures of precious metals, cavities and voids in the earth with full Color 3D Image Analysis. OR 2. A lightening fast mode for locating individual targets and gold nuggets at impressive depth with full discrimination and audio tone identification. Specially designed treasure detector for surface, middle and deep search range. A non-motion deep treasure detection mode capable of both precious metal and void detection. Just attach the standard T44 coil and you will quickly begin discovering hidden treasures in areas previously searched with other detectors! This non-motion coil measures 36 x 44 cm. For users requiring more depth, just attach the larger T100 coil and you will be able to detect larger targets buried at unbelievable depth. This coil measures 60 x 100 cm. Mode 1 was designed with ease of use in mind. The intuitive interface is simple to understand for all users; both amateurs and professionals alike. 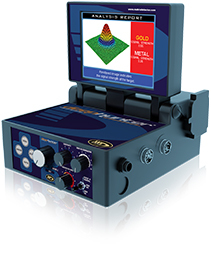 The Deephunter metal detectorcolor display shows you a visual representation of the target signal with advanced 3D image analysis. In addition, you will see the metal type, depth and size of the target you have detected before you dig it up! You can see both the 3D graph and the metal identification on the report screen that you will obtain after target detection. Thanks to its perfect metal identification, Deephunter metal detector. indicates the type of metal detected in one of four different groups: 1. Gold 2. Precious 3. Non-precious 4. Steel. Besides accurately detecting and identifying metal, the device can also locate underground structures such as caves, cavities, repositories, tunnels, shelters and tombs – all with advanced 3D graphic images. Metals can also be identified within these underground structures. The device accurately shows the depth of the detected target in centimeters on the display. The built in Ferrous Rejection feature allows the Deephunter metal detector to eliminate non-precious and junk metals while still detecting only precious metals. Now you can discover the treasures that others have only dreamed of. In Mode 1, the oscillation system continuously shows the signal graph of the target on the visual display. Fast recovery mode capable of detecting individual coins, gold and small targets at exceptional depth with audio target identification. In this mode, with the motion C32 standard coil (26 x 32 cm), you can easily detect single coins, jewelry, gold and other tiny objects located at depths which cannot be reached by other detectors. Add the optional larger C47 coil (39 x 47 cm) and you will be able to reach larger objects at greater depth, just as you can in Mode 1. This system is easy to use and identifies metal at great depth. The user is alerted to the type of metal with three different sounds. Now you can easily hear if the target is gold, precious or non-precious. You can easily perform your searches in all types of ground conditions due to Deephunter’s special settings in Mode 2 which is designed for highly mineralized conditions. By using the ferrous settings, you can prevent false signals by eliminating the interferences from minerals in highly mineralized ground conditions or areas containing high concentrations of iron such as beaches, wet sand, plowed soil etc.